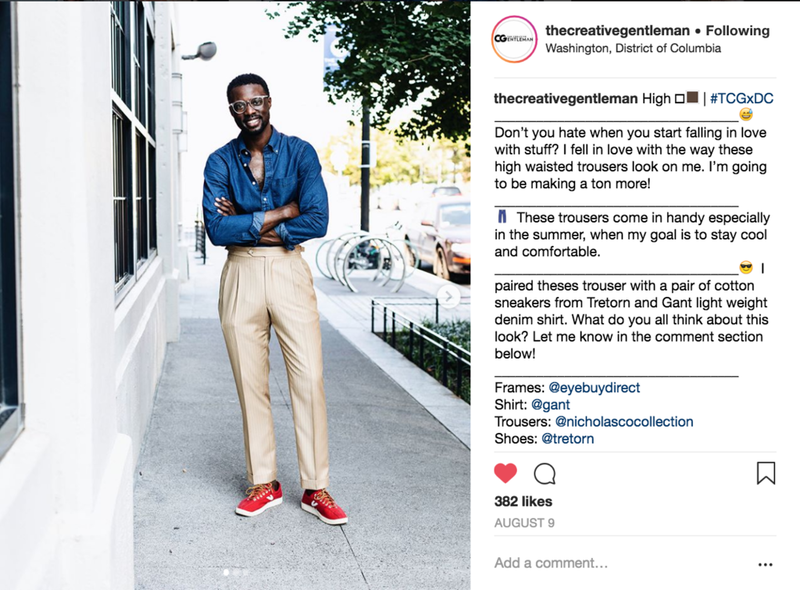 I get asked quite a bit about other local menswear Instagram accounts that I follow in DC. Here's a list of some of my favorite accounts that feature men's fashion, style, and are an all around dapper group of guys. When is comes to style and men's fashion, O'neil definitely knows how to pair pieces from every spectrum. His looks are effortless and well thought out. This man knows that styling is one of the most important parts of a man's outfit. Chris is a guy that knows how to street-style but also understands the meaning of a well-fitted suit. He's also a local designer with his own brand of men's tanks, hats, bags and other accessories. Catch him hanging around H Street NE soon for the launch of his new pop-up shop. You can find Daniel pretty much all over DC. He has such a great range of fashion & style which shows in his feed. Working for custom clothier J.Hilburn gives him the opportunity to show the ins and outs of men's suiting, but he also shows that casualwear is an important part of showing off your personality. Sam blows me away with his affinity for men's outerwear and how he styles each piece he wears. He gives each outfit he styles an edge that is unmatched and so individual. If you're looking for ways to style those old pocket squares, he has your answer. I have serious closet envy of this guy. If you ever thought that you couldn't rock a beanie all year long, you are sorely mistaken. Romin shows off effortless style, flipping the traditional suit on its head. Looking for ways to give that boring old suit some personality? Check out his feed and I'm sure he'll give you 100 new ways to refresh your suits that have been hanging in your closet for years. Barnette is one of the original menswear guru's in DC. His passion for suiting and finding the perfect dress shoe to pair with every single one of his outfits is impressive. A "man about town" you can find him attending all sorts of events around the city. He also runs the local website Men's Life DC where he features food, sports, and fashion. Tony knows all about approachability when he styles his outfits. Think mixing tees with suit jackets and blazers. He shows that it's ok to wear pops of color with your suits which is just one of the many ways to show off some of your personality at the office. He also knows how to rock a mean printed button-down shirt. Anthony is all about versatility and showing off his personal take on men's fashion. His ability to show his outfits in different spots all around the city show that he's the type of guy that's not afraid of color, pattern or his physical surroundings. He's modeled for various local brands and also runs his own design, photography, and modeling business. Who are some of your favorite local menswear Instagram accounts that you follow? Leave them in the comments below!